Courses are offered on a year round basis during the winter and summer sessions (4 terms in total) of UBC’s academic year. All 11 of the core courses are offered during both terms of the winter session and at least one term of the summer session of the academic year and are held primarily in the evenings. Some courses are offered online and on Saturdays. 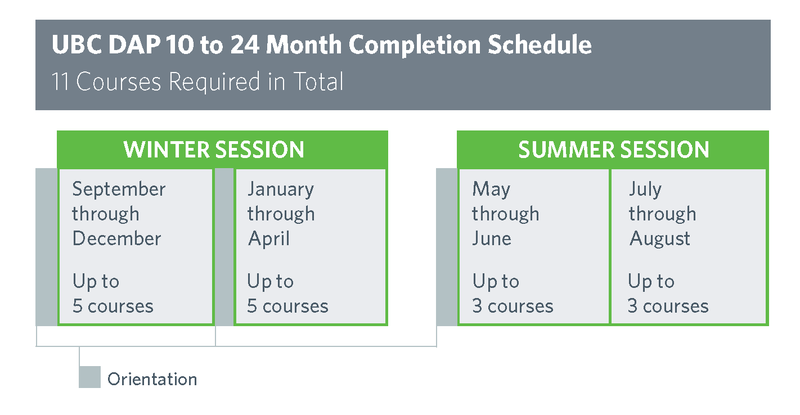 Students enrolled in the full UBC Diploma in Accounting Program can take a maximum of 5 courses in each of the 2 winter terms and 3 courses in each of the 2 summer terms enjoying the flexibility to finish the full program in a little as 10 or as long as 24 months while continuing to work. Optional elective courses allow students to satisfy all the CPABC Professional Education Program entrance requirements. Students are admitted to start the Program in September, January, and May. The UBC DAP Program is offered through a combination of online and evening classes. The majority of in-person classes are held at UBC’s Point Grey Campus in the Henry Angus Building at the Sauder School of Business. Four Senior Level Courses, BUSI 353, 355, 450, and 455, will also be offered in select winter terms at UBC Robson Square on a trial basis starting September 2016.